Thomas the Tank and friends welcomes your little one their train-filled world. Our large assortment of Thomas Toys gives your child all the pieces they need to build their own Thomas the Tank train yard. You can buy different Thomas Toys such as engines and help your child collect all the engines in the Thomas collection. Many Thomas Toys have become collectables as the popular television show continues to be a part of childhood. 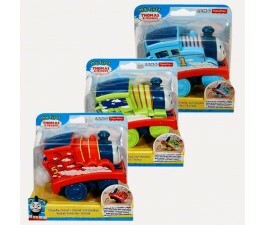 Shop online today and give your child a piece of the Thomas Toys nostalgia. Our online discount prices are often better than other toy stores' sale prices. We can also ship your order anywhere in Australia. Immerse your child in a world of imagination with Thomas and Friends figures, tracks, and other play sets. Thomas toys have delighted and educated preschoolers for decades and continue to do so today. These popular toys have numerous features and benefits that help kids learn all kinds of useful life skills, from fine motor skills and hand-eye coordination to cognitive and spatial skills. As kids assemble a track for their Thomas toys to drive on, they can often come up with their own unique configurations, learning useful things such as whether they need curved or straight track pieces, how many they need, which configurations will work and which won't. Thomas toys also teach kids social skills such as fairness, making and losing friends, being afraid and being brave, and how to handle the emotions that accompany many of these situations. They’re also great for kids to play with solo or with friends, teaching both cooperative play and the value of alone time. And there are many Thomas toys available, including train and track play sets, train figures, plush toys, games, and even a Sing-A-Long Karaoke Thomas! When you’re looking for toys that will provide your preschooler with the developmental concepts he or she needs, check out Thomas and Friends toys and give your child the gift of adventure and discovery.